Many homes in Annapolis are covered with vinyl siding. Although it can look great, there comes a time about 20-25 years into its life that its condition begins to decline. This can leave your home looking less than its best! 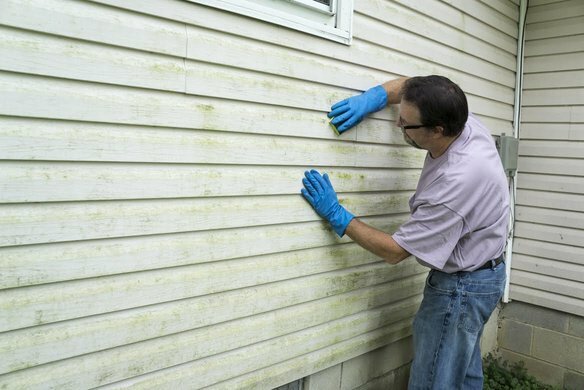 When your siding eventually begins to wear and look old, no matter how much scrubbing you do, it might be time for one of two things. You have two options: spend a lot of money on brand new vinyl siding for your home, or invest in paint for your vinyl siding. Columbia Paint Company is one of the few stores in the Annapolis area that supplies this type of paint! When your siding eventually begins to wear and look old, no matter how much scrubbing you do, it might be time to repaint it. New Paint or New Vinyl Siding? What is the overall condition of your vinyl siding? If your siding is cracked or damaged, a coat of paint won’t help repair its structure. On the other hand, if it’s simply worn out and faded, a fresh layer of paint will be able to work wonders in bringing it back to looking its best. How much longer will your vinyl siding last? Painting is a great short-term fix for vinyl siding that still has life left in its years. Vinyl siding paint will last about 5-7 years, whereas replacing your siding will last about 20-25 years. Which option you choose will depend on how long-term of a solution you’re looking for. Painting your vinyl siding can be a DIY job, but it’s a big job to take on. Your house is a lot bigger than you think it is! It might save you money, but it’s an enormous undertaking. If you hire a professional, do your research ahead of time to find a reputable contractor. Stop by and see us at Columbia Paint for advice and recommendations! Do you need some great Benjamin Moore paint to get started on your exterior painting projects in Annapolis? Columbia Paint Company is your one-stop shop for all of your home-decorating needs in Howard County. From fabulous Hunter Douglass window treatments to beautiful Benjamin Moore paint products, we have everything you need to make your dream home design a reality. Schedule an appointment with our design consultant today!